What Grease Should I Use? 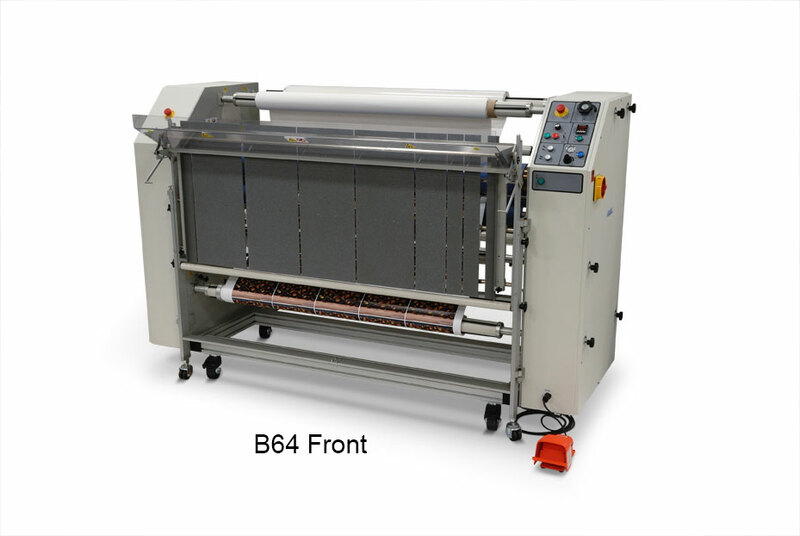 The B64 is designed to provide quality lamination of a wide range of papers and materials up to 3 inches / 7.62cm thick using film up to 10 mil / .254mm thick. Ledco is known for making machines which are very reliable, easy to use, and inexpensive to maintain. These units maintain that reputation. A scrap rewind with an adjustable clutch takes up the release liner found on many pressure-sensitive films both top and bottom and for finished material. Roller bearings with alloy construction and high quality motors insure a long and trouble-free life for these machines. 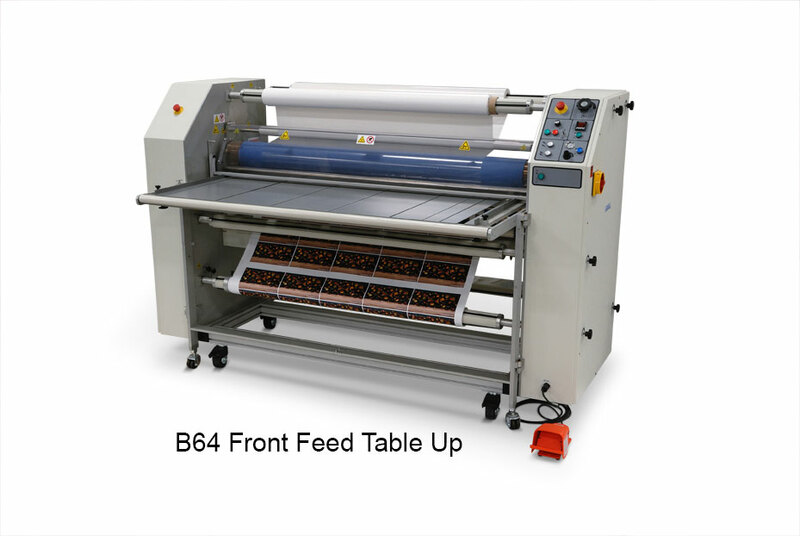 The laminating roller opening is adjustable in seconds and allows operators to work with different thickness materials. A variable speed motor control allows operators to apply different materials to different substrates. The feed tray is non-ferrous, so magnetic materials may be applied. The supply roll tension knobs are important because without some supply roll tension, most films and tapes will wrinkle during application. A reverse drive switch makes it simple to back material out of the laminating rollers or correct material wraparound. The machine comes with locking castors. A safety shield with electronic interlock prevents operation of the machine if the guard and the feed tray are not in place, protecting operators and other employees. 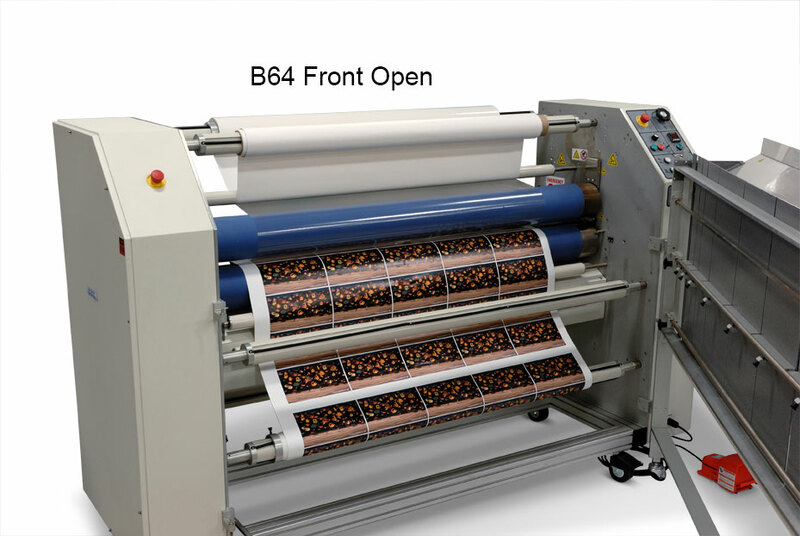 Four emergency stop buttons with two on each side of the machine (one in front and one in rear) will automatically stop the machine and open the rolls when the operator pushes them in. In addition, there is an emergency stop bar located on the back of the machine. Manufactured in the USA means quality, better service and faster parts availability. Ledco machines come with a 2 year factory limited warranty. Weight / Shipping Weight 650 lbs. / 800 lbs. Models: B640220A, B6402203A, Crating B64, B64Fed Tab 3" & B64Fed Tab 1/2"